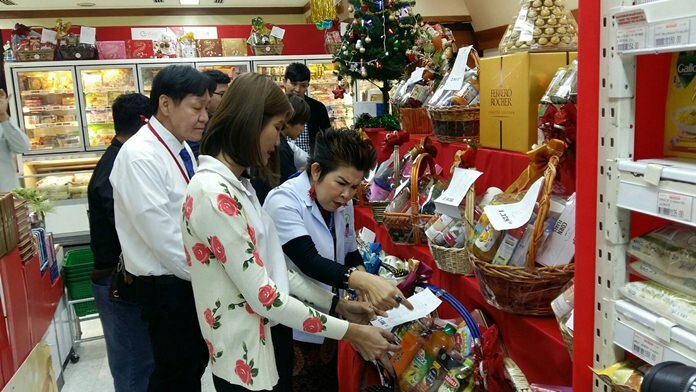 Bupha Songsakulchai from the Pattaya Health Department leads inspections of New Year gift baskets in popular malls and super centers around Pattaya. Pattaya health inspectors checked holiday gift baskets at Pattaya supermarkets and shopping malls. Bupha Songsakulchai of the Pattaya Health Department led a team of inspectors to Foodland on Central Road and, later, to Central Festival Pattaya Beach and other area shopping malls. Bupha said annual checks are needed to prevent food poisoning and other problems, since most of the products are canned or boxed and could be expired. They also checked the baskets and the products therein have proper labels written in both English and Thai. Inspectors urged anyone buying gift baskets anywhere to call 1556 if they find expired or spoiled food inside or other problems. Fines for selling expired goods or those without labels can reach as much as 30,000 baht. Next articleTime to be merry?